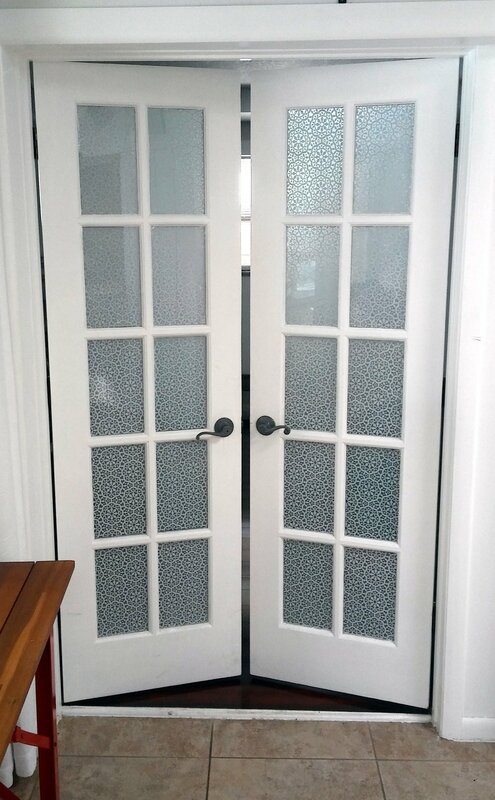 When we moved into our current house - the french doors leading into master bedroom were see-through glass. It made little sense, so something had to be done. We hung some curtains up, but I also ordered some privacy glass film, that supposed to go on with just soapy water and squeegee, no gluing required. I forgot about that film for a good six months or so. After the Barn Door was finished, I went on a bit of a door making/makeover trip. So I found the roll, cut it up into proper pieces with a ruler and put it on. Two things happened: I didn't care for the design and I ran out of film before I could finish. It was also discontinued. So I ordered more of a Moroccan style film (enough of it this time) and did it right. Overall it works excellent and looks very elegant. After over a year, no peeling issues of any kind. Cutting each piece is tedious, but was easily worth the effort.